May 24th marks the Feast day of Saint Sara also known as Sara la Kali. She is venerated at Saintes-Maries-de-la-Mer in the South of France. It is a place of pilgrimage for the Roma to honor Saint Sara la Kali. But who was Saint Sara? There are a few accounts about her origins. Saintes-Maries-de-la-Mer was the place that the three Marys fled to after leaving Palestine. Saint Sara was said to have saved them. In other accounts she was their servant from Upper Egypt and othe othe say she was an Egyptian Princess. Though Ronald Lee, a Canadian Romani writer, linguist and activist suggested in 2001 that Saint Sara la Kali was part who is actually part of Kali/Durga and that Goddesses were transferred to a Christian figure. This is due to how she is worshipped on her feast day. While it’s unclear what Saint Sara la Kali’s origins were, what is very clear is the devotion and love she inspires in her followers. Devotees say she their “mother.” The first aspects of the veneration of Saint Sara la Kali is the pilgrimage to Saintes-Maries-de-la-Mer. The pilgrimage is an important aspect of spirituality to the Romani, and they have been making the Pilgrimage to Saintes-Maries-de-la-Mer since the 19th Century. 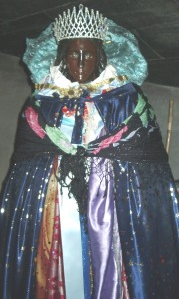 The next aspect of the veneration of Saint Sara la Kali is her effigy which is kept underground in the church. The statue is dressed in bright clothing made by the Romani. A tiara adorns her head. People touch and kiss her clothing. They pin notes to them, leave photos of departed loved ones and trinkets. The statue of Saint Sara la Kali is then carried from the church to the sea in a ritual bath so to speak. It also reacts her arrival in France. The ritual is also parallels the worship of Kali. The procession is a grand affair led by the Archbishop of Arles and Aix-en-Provence, complete with people singing, playing instruments and men on horseback. Martine Guillot is a lay member of the ministry team at the church. “In all the stories about Sara, I think the most important thing about her is that she loved and served the Holy Marys, and if she loved them she also loved Jesus,” she says. Thanks to Fatma for suggesting this post!